This is head part of 36 inch wooden chess. It King piece head sized 36 inch that made of Teak wood. Polish in black and glossy perfectly, so elegant and gallant. This is the handmade product, made by professional craftsman with their expert skill in carved wooden product. Perfect for your garden decoration or hotel decoration. You may put it outdoors for long time. This kind of garden decoration is very durable because made of Teak wood, which is famous as the strongest wood in the world. 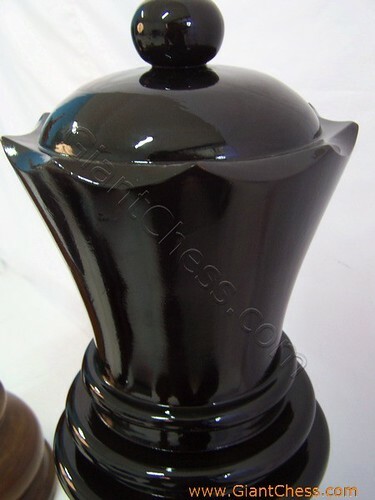 We are manufacturer of giant chess pieces in various sizes. You may choose your favorite chess pieces and order to us. We also serve in big chess, chess set, standart chess, 12 inch chess, chess board, chess table, and other chess product. All of our product are made of Teak wood in high quality. Those are carved by our expert craftsman from Java island. You can see our product in many famous hotel and resort in western countries and Europe.